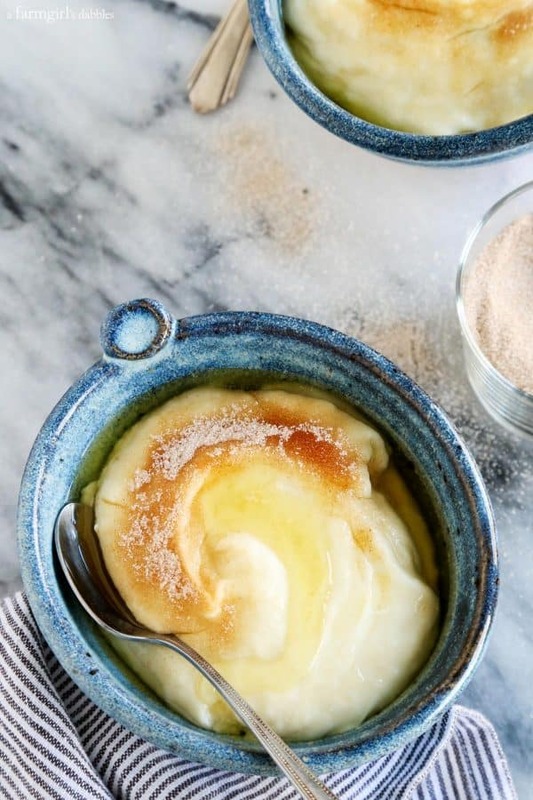 Rømmegrøt is a warmed Norwegian pudding that our family likes to eat with a hefty drizzle of melted butter and a good sprinkling of cinnamon sugar. My heritage is mostly German. Blake’s is 75% Norwegian, 25% Swedish. And ever since our first Christmas together (1999), I had been hearing about Rømmegrøt in different conversations across his family. While Blake’s family members were saying I should try rømmegrøt, some were also telling me to give lutefisk a fair shot. Now I’m a fairly adventurous eater, but I could die quite happily never letting lutefisk cross my lips. It’s just something I don’t feel the need to accomplish in my lifetime. Ever since then, I have (unfairly) lumped these two Norwegian foods together in my mind, summing them both up as unworthy of my taste buds. Be sure to also try a couple more of our favorites, this Sour Cream Coffee Cake with Cinnamon Ripple and our favorite Sour Cream Banana Bread! It was a cold March day, sun-less and dreary, when we visited the Sons of Norway in Fargo, North Dakota with Blake’s family. Stepping inside, there really was no evidence that we were actually in Fargo. The place gave a nod to its Norwegian ancestry everywhere we turned. 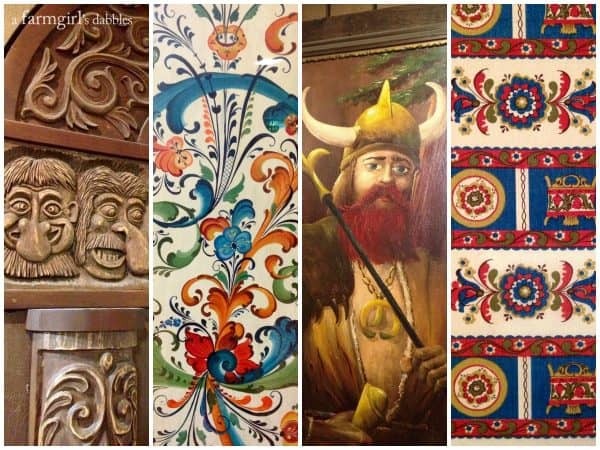 The whimsical wood carvings of trolls, beautiful rosemåling, huge framed paintings of valiant Vikings, and oh-so-lovely wallpaper designs were the only decor in this space of dark paneled walls. It was here that I ran head-on into my first experience with rømmegrøt. And I gave in and let the kind lady hand me a bowl of this simple, warm Norwegian pudding. I was advised to pour some melted butter over the top, followed by a generous sprinkling of cinnamon sugar. After finishing bowl #1, I went back for bowl #2. With more butter and more cinnamon sugar the second go ’round. That stuff was wonderful! Then I asked one of the servers if they might be able to share their rømmegrøt recipe with me. Because, first, I wanted to make this at home because it was so delicious. And, second, I wanted to preserve a bit of Blake’s heritage, to pass this tradition on down to our own daughters. I was invited back into the kitchen, where I met Vivian. Standing at the stove with a red apron tied around her back, Vivian was stirring the thickening milk mixture, watching the thermometer rise. She chatted me through the recipe and was happy to share it with me. The recipe showed obvious visible signs of being well-loved, with its crinkled paper and bent corners. Several lines in the directions had been crossed out, with revisions handwritten in ink. Those are always good signs of a tried and true recipe. So why did it take me so long to actually get around to making rømmegrøt myself? There’s an easy answer to that >>> I lost the recipe and the photos I took that day. But, thankfully, while organizing photo files earlier this year, I found them again. I proceeded to make a duplicate copy of the photo file and placed it directly onto my computer’s desktop. I’ve been waiting almost all year to share this recipe with you! This rømmegrøt recipe is a simple mixture of milk, butter, flour, sugar, and salt, the very same recipe that I enjoyed at Fargo’s Sons of Norway and basically the same recipe that I’ve found in many cookbooks and on many online sites. But I am now (Dec. 17, 2016) updating this post due to reader feedback. “Rømme” translates to sour cream in Norwegian, meaning a true rømmegrøt recipe would have sour cream in it. This recipe does not, so it would technically be called fløtegrøt. 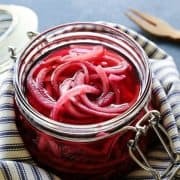 I am not going to change the title of this post and recipe, as this is exactly how so many people know rømmegrøt, including my husband’s entire side of his very Norwegian family. All I can say is that everybody makes their own variations on recipes, in both ingredients and recipe titles, and this is one that has obviously found its own alterations along the way from Norway to America. Loree, my mother-in-law, recalls her own mom making rømmegrøt whenever there was excess cream from milking the cows. 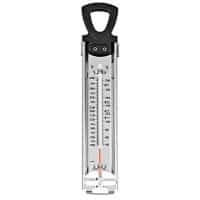 This provided an inexpensive way to put food on the table. And when making this for her own family, Loree remembers her three sons being in favor of her switching from cream to skim milk. This resulted in rømmegrøt that was less rich…which simply meant that her sons could eat more of it. Like this rømmegrøt? Pin it! Our family likes to eat this warm, with a hefty drizzle of melted butter and a good sprinkling of cinnamon sugar! In a large saucepan over medium heat, heat milk to 195° F. Stir almost continuously so milk does not burn, scraping the bottom of the saucepan. 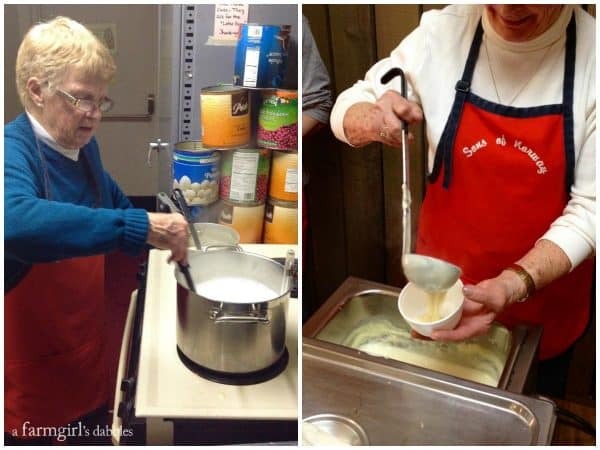 While milk is heating, whisk together flour, sugar, and salt in a small bowl. Set aside. While milk is heating, melt butter in a small saucepan over medium heat. 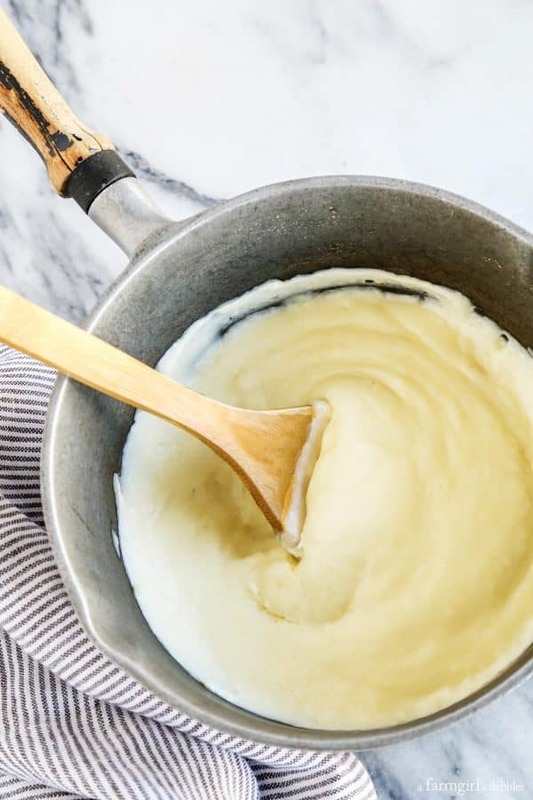 Turn off heat and hold until milk has reached 195° F.
Once milk temperature has reached 195° F, stir flour mixture into melted butter to form a thick paste. Transfer to the heated milk and stir constantly until milk starts to boil. Turn heat down to low and let cook for 5 minutes more, stirring often. Remove saucepan from heat. 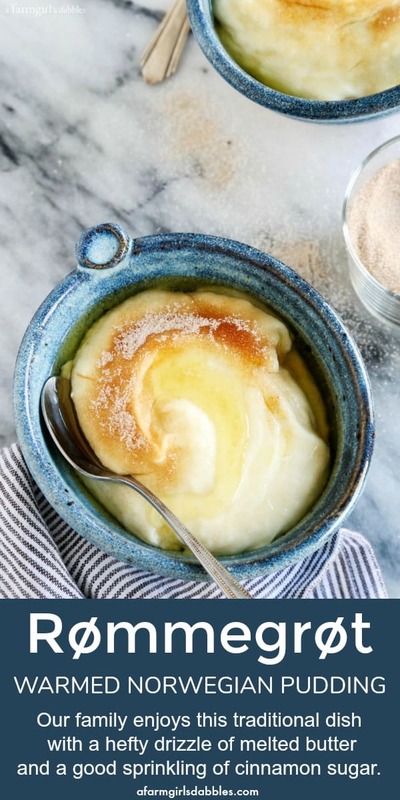 Pour into individual bowls and serve with warm melted butter and cinnamon sugar (the more, the better!). Adapted slightly from the recipe that Vivian Wensel shared with me in the Sons of Norway kitchen in Fargo, ND. I’ve heard nothing but good things about this! Thanks for sharing the recipe and the story. No matter what it is called, we’re looking forward to having this very soon! I haven’t made this specific recipe, yet. But in 1990 I made this from a recipe in Bon Appetite (? ), and LOVED it. But I lost the recipe and the magazine stopped publishing. I am so excited, I get to make it again! Thank you!!! Wonderful!! I hope you like this! I just heard of rømmegrøt on Twitter, so looked it up and found this post. So I just tweeted a link to this post to the person on Twitter. This is such an interesting dish. I think she was planning to make it with sour cream. Hello Jean – thank you for sharing! Thank You for being a great wife and making a Norwegian history dish for your German husband….. 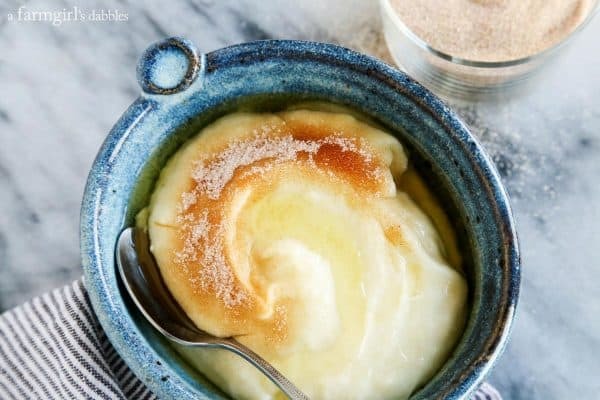 I am 100 % Norwegiam and we had this Rommegrote pudding as an appitiser before the main meal at Christmas and New Years…My dad use to cook it in a double boiler to prevent burning …. 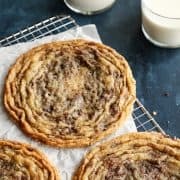 I love the idea of adding a little vanilla and almond flavoring!! A new favorite dessert in our house! SO good! What an incredible flavor! I’m definitely going to make this again! Loved the story behind this recipe. Absolutely delicious! When I was growing up this was a treat we would get when sick. Amazing sometimes we would all say we were sick and need it, (we called it milk mush). Grandma would laugh and make it for all of us. She also made Lefsa from scratch; I remember peeling the potatoes. Lefsa was once a year treat. She died at the age of 99 and five months from 100. I am 67 and her first Grandchild; the Dr. tells me that I come from good genes. Thank God for the Scandinavian in me! Just want to thank you for the recipe! I grew up in MN with my grandparents who came from Norway. I was a little girl surrounded by our Norwegian heritage! Grandpa was a Lutheran pastor, so we attended MANY lutefisk dinners. This and lease was the reason for us girls to go! My grandmother made this a lot, just like your recipe. She would say that in Norway, they used sour cream. Although I’ve eaten this tons over the years, I’ve never had the sour cream version. Maybe for Christmas this year?!? I think it’s a term many Scandinavian Americans use in reference to a dish minus sour cream – even knowing that’s not the literal translation. When you serve the rømmegrøt, you sprinkle suger and cinnamon on the top, and finish off with some of the fat that was separated from “Rømmegrøten” …. When I read about making it with skim milk I thought how awful! When we visited Norway we had it on the menu 2X in one day! I felt my carotid arteries clogging up, but oh well I thought! (creammush). I am Norwegian and from Norway. 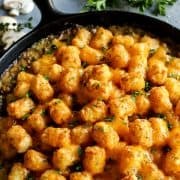 Hello Sarah – this recipe is how my husband’s family (his mom and his grandma) have always made it. I do realize that sour cream is used traditionally, but this is how the Sons of Norway in Fargo serves it, where I first enjoyed it. I’m also curious as to how it would be eaten in Norway. For which meal? My family tended to eat Rommegrot (or flotegrot, rather) for breakfast often. Or at holiday gatherings it was more of a side option (either before, during, or after main meal). Hello Liv – please refer to all the previous comments where this has been discussed. This morning I woke up feeling like I needed a taste of home, and rommegrot came to mind. I definitely have the good old rural North Dakota church cookbook with the recipe, but for some reason googled it. Your blog made me smile. 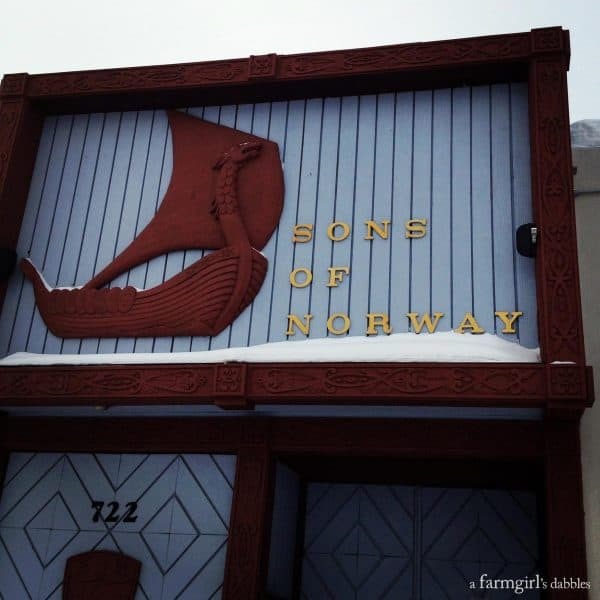 I’ve gone to that Sons of Norway with my grandparents many times. When I was small I’d put the lutefisk inside my rolled up lefse and squeeze it out the back in an attempt to make my parents think I ate some! As for this rommegrot, I just made it in my modified way. I now live in rural Africa, with poor electricity. I cut the recipe in half so I can eat it all today! I used powdered milk since I don’t have the real stuff. And I used “baking butter” since real butter is rare, and margarine doesn’t melt here. But the “baking butter” has pineapple flavoring. Let’s just say this pudding reminds me of home, yet lets me know I’m not…the flavor is just off a bit. But I knew it would be going into this cooking endeavor. Thanks for the yummy recipe and the reminder of home. Can you store this? And if so for how long? And to re-serve, do you add anything or just warm it up in the microwave? I think this would keep well for at least a couple days. When I heat it, I like to warm it in a saucepan on the stovetop. I add a little milk or half and half if it needs to be loosened up a bit. Is the Norwegian pudding served warm? Rommegrot is Soooo food. If you’re ever in the Holmen, WI area, Drugan’s serves it on their Sunday buffet in the fall/winter months. I often add Door County cherries (unsweetened or lightly sweetened ). A great way to end your meal. Add 4 cups milk and dash of salt and tablespoon of sugar. Cook until thick. Serve with butter,cinnamon, and sugar on top. Forget all the extra steps – same results. 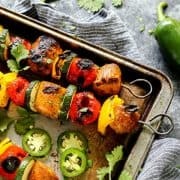 I just found this deliciouness on Pinterest! Thank you for sharing! And thank you for your patience with all the comments calling you out you had addressed numerous times. I am trying it now! Thanks for posting! 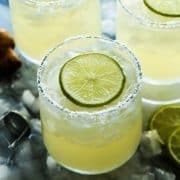 My husband and I love this recipe. Ever since we read it here, we’ve had this delicious dish at least twice a week! It wards off the chill of winter so well. I made it today and we LOVED it! I think I’ve found a new Christmas tradition! Thanks! Oh my thank you for sharing this! The memories it brought back having Norwegian Grandmas we had this for special occasions and especially at Christmas. Gonna make it for this Christmas! Thanks again! My grandma would fry left overs in the frying pan with butter!. my gramma would call it just grout when she excluded the cream. Uffda it is so good!!!! It is a great dish. Dessert, maybe. When we make it, this is all we eat. I love it. Oh, I just read your other responses. I saw the recipe on Sons of Norway using sour cream too. Maybe it can be made without it I’m guessing. Hello Cynthia – The Sons of Norway online site does include sour cream in its recipe. But I first ate this at the Sons of Norway in Fargo, and this is the very same recipe that they shared with me. I have updated my post to talk about this more. Hi there. My Norwegian grandparents used to make this when I was growing up but they used sour cream. I’m curious why yours doesn’t use sour cream too? This looks really good. I think I’m going to have to try this one. 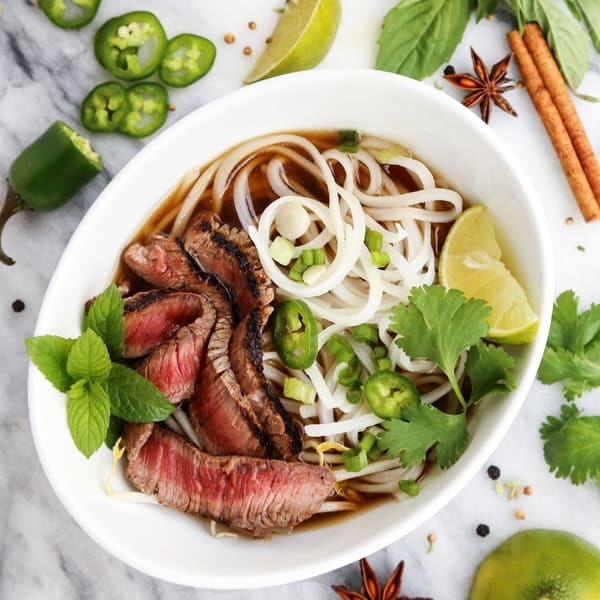 Seems simple and yummy. Rømmegrøt is made frem sour cream. Hence the name Rømme which means sour cream. It is not a dessert but can be served as a main course with cured ham and Norwegian flat bread. I realize this, Kristin. But this is what so many Norwegians around here know this dish as, and mostly how they make it and eat it. I simply made this according to how I was introduced to it at the Sons of Norway. My mothers parents immigrated from Norway and my Grandmother would make Rommegrot with soured milk. A little sour taste makes it good with the sugar, cinnamon and of course butter. I would definitely like to try the soured version! We called it Milk Mush…. I’ve heard that term, too. Thanks Michelle! That sounds incredibly delicious! What a great memory for you, thanks for sharing! This reminds me of one of my favorite comfort foods: macaroni and milk. Just add any kind of cooked pasta to simmering milk and butter. I have usually enjoyed it in a savory fashion, adding salt, Parmesan cheese and/or pepper. Now I will try it with cinnamon! Thank you! Mom also made this with rice, and a few raisins…and I also remember her taking them out of the oven? Anyone else? I like that idea! Thanks, Susan. Yes – my mormor made that dish almost every Saturday. It’s called ‘Risengrønsgrøt’, or ‘Risgrøt’ for short. And always served with melted butter, cinnamon, and sugar sprinkled on top! Romme is a soured cream in Norwegian. Which was a surprise when I ate REAL Rommegrot in Norway.. I grew up with Rommegrot made with farm cream. It is even more tasty. What you call rommegrot is what my mother called milk mush. Thanks for sharing this, Leanna. I will definitely try the sour cream route at some point – it sounds delicious! This is the recipe where I first I enjoyed it myself, at the Sons of Norway – and this is how my MIL and her mother used to make it. Everyone calls it rommegrot, though I definitely hear what you are saying. What you are making is called Fløtegrøt or Fløyelsgrøt in Norway , fløte meaning cream. Love it but it’s not Rømmegrøt. Rømme translates to sour cream and is made with a very fat Norwegian sour cream . 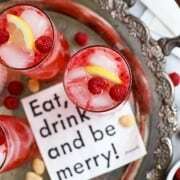 It is served the same way, red berry juice to drink. It’s also served with cured and smoked meat, but then only with the butter of course . I know some Americans when being served real Rømmegrøt (sour cream porridge) in Norway, they don’t like it because it’s sour . Hello Mai – thank you for your comment. You helped me think about how to address this. I have updated my post to include this information. 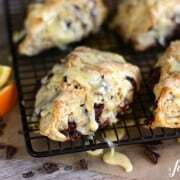 I will try making this with sour cream – I am definitely curious on the difference in flavor. Can you make this ahead of time? How do you reheat it? I do refrigerate leftovers and then reheat. It will definitely thicken. I add a bit of half and half or milk, heating the rommegrot in a pan with it. Use a whisk to get it all incorporated and smooth. pan being used to make the pudding. My husband’s family is part Norwegian and every Christmas we have this after the main meal. BUT there is an almond hidden somewhere inside and whoever’s serving contains the almond is blessed with good luck for the upcoming year! It’s sort of a game between everyone now! His grandmother also makes leftsa, served with butter and sugar, and Krumkake (delicious little wafer like cone shaped cookies/crackers. However, I like you as well as my husband bypass the Lutefisk and try to avoid the pungent smell!!! Oh, so much fun (the almond)!!! Thanks for sharing! 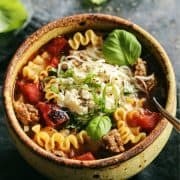 Could you make this ahead and then keep warm in crockpot to serve? I think that would work. Depending on how long it’s in the slow cooker, you may need to add a bit more milk or half and half to keep it from cooking up too thick. i loved reading this story so much, and reminds me of my roots, and all the traditional german/norwegian recipes that have been passed down to me as well. My grandma still rolls the thinnest lefse I have ever seen anyone make. This pudding is new to me though, and surely picked my curiosity. Butter, and cream, and cinnamon… what could be better served warm after dinner. Thank you so much, Amanda. I definitely have an appreciation for that thin lefse! My husband’s mother used to make this and add rice. I had never had it before until I tasted hers soon after we were married. She served it as a meal, and it was delicious. With rice, that’s interesting. And it sounds good! Thanks for sharing, MaryAnn. I am so intrigued by this Brenda!! Looks amazing and I love it highlights your lineage! It’s interesting… I feel like most cultures have a pudding recipe. I wonder why that is? Maybe because pudding is so comforting and easy to prepare (and inexpensive to make)? I don’t know. I think that’s true, Brian. My MIL said the inexpensive piece was definitely a factor. Extra cream from the cows + flour, butter and sugar = a meal. 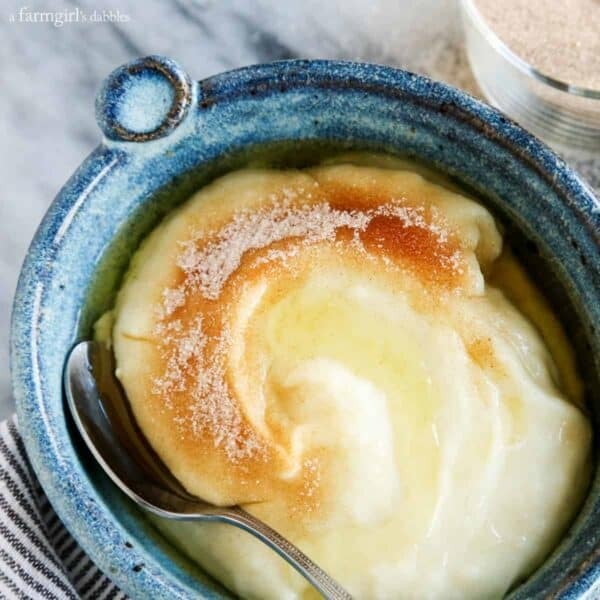 Or dessert with the addition of cinnamon sugar! We have this treat at Christmas, too, and everyone loves it. A little trick though is to make it in the microwave and it is every bit as good. I melt the butter in a large bowl in the microwave, whisk in the flour and let that cook a minute and then whisk in warm whole milk and microwave it till thick, stirring every minute or two. No scorching or burning! Yum! I’m getting hungry for it just typing about it. Melt extra butter to drizzle over the top and have the cinnamon sugar handy! We have a Drive Inn restaurant and used to serve it with potato dumplings and ham – very popular. Several small town restaurants up north of us serve this every Thursday. I had seen microwave recipes for this, but never thought they’d actually be good. Thank you for sharing, Marlene. (Although there is definitely something to be said about a lazy slow stirring of a pot on the stovetop!) You made me hungry for potato dumplings and ham, YUM! This was such a lovely post! 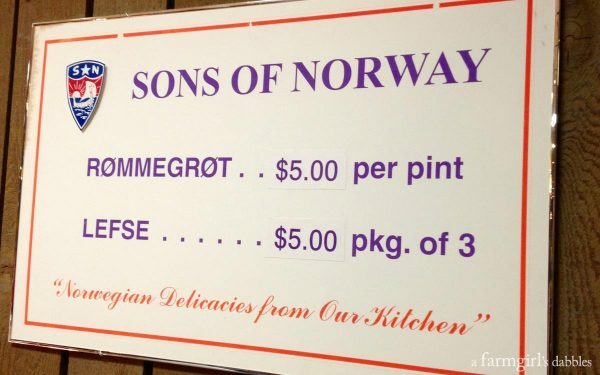 Really interesting to learn about the Rommegrot recipe, and I loved the glimpse into the Sons of Norway. Thank you for sharing. Thank you so very much, Jen. Thank you Jean – I’ll have to look that up! Definitely pronounced “Ruh-meh-gruht” as the Norwegian letter ø makes an “uh” sound. Rømmegrøt translates to “Sour Cream Pudding”. So, a real Norwegian recipe would include sour cream. “Rømme” is a type of sour cream. So without that in the recipe, it’s just something like cream pudding. I have ZERO idea how to pronounce this…but I know I definitely want to try it! It looks so creamy and good! We say “ROO-meh-grot”. But I’ve heard others say “ROO-meh-graut”. Thanks, Taylor! Did you go to Sons of Norway this year or was this from last March? 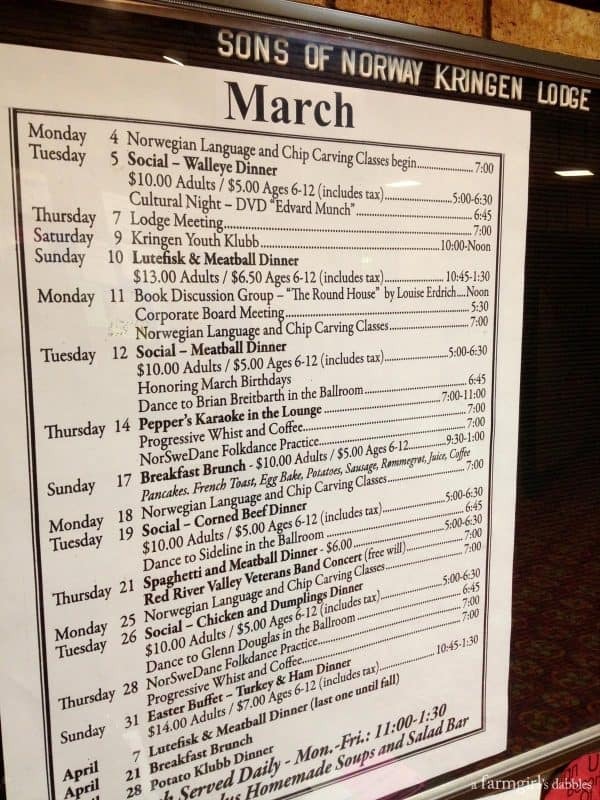 I am a little confused because the menu board says March. I am genuinely curious because I have been wanting to visit Sons of Norway and I am eyeing that Corned Beef and Cabbage meal lol! This pudding looks devine and I will have to make it and see what my children think of it! Thanks for another great recipe! This sounds like the base for my southern homemade banana pudding minus the cinnamon and sugar. I know that’s delicious. I have a hard time refraining from eating it all before I layer vanilla wafers and bananas. I will definitely try your recipe, seems perfect for the season with the butter, cinnamon and sugar. Sounds Decadent! Homemade banana pudding, OMG that sounds wonderful!!!! Do you think I could sub arrowroot for the flour? Or anything else? Wheat allergies here. Thanks! Bobs Red Mill one for one gluten free flour works great as a sub for all purpose flour. 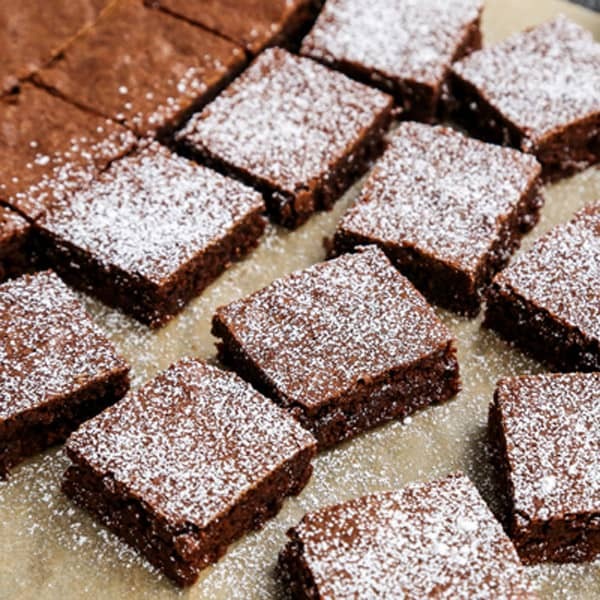 I do very little GF baking/cooking, but I would have to agree with Daphne – I would try a GF flour that you trust. This looks interesting. Would you consider it a dessert? I bet you could pass it off as a dessert, much like many serve rice pudding as a dessert. It would make a good snack too! Hi Susan – this is mostly served as a dessert. But I also shared within this post how my MIL remembers eating it as a very simple meal (minus the butter and cinnamon sugar). I agree, Bailey! Especially now during this holiday season!